Factory Sealed 2014 Upper Deck SPx Football Hobby Box mit 10 packs a 5 Cards. 4 Autogramme oder Memorabilia cards Per Box ! 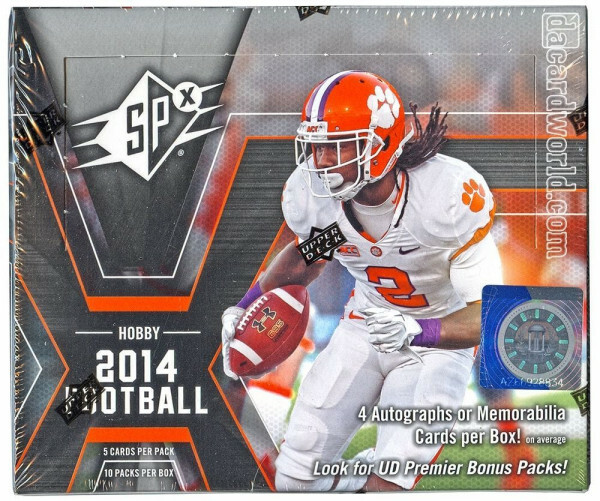 Produktinformationen "2014 Upper Deck SPx Football Hobby Box"
Factory Sealed 2014 Upper Deck SPx Football Hobby Box mit 10 packs a 5 Cards. Each Box contains Two to Three Autographs Per Box, including at least One SPx PMG Rookie Auto Jersey Card! Find Three SPx Finite Rookies or Legends And Three 1996 or 1997 SPx Hologram Cards Per Box! Look for UD Premier Autograph bonus packs containing an UD Premier Rookie Autographed Jersey card or Veteran/Legend Autographed jersey card. Find One to Two Single, Dual, Triple, or Patch Memorabilia Cards! - Collect Rookie Auto Jerseys with PMG Technology! Weiterführende Links zu "2014 Upper Deck SPx Football Hobby Box"
Fanbewertungen für "2014 Upper Deck SPx Football Hobby Box"